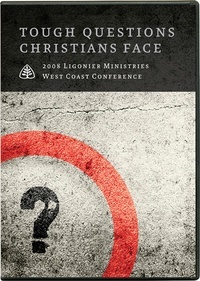 In this collection of messages from the 2008 West Coast Conference held in Scottsdale, Ariz., Ligon Duncan, John MacArthur, and R.C. Sproul look at six of the toughest questions Christians face. They focus on the biblical approach to issues including science, the problem of evil, divine sovereignty, human responsibility, the exclusivity of Christ, postmodernism, and the Gospel. When this conference was announced, I was surprised as it was going to be held less than 5 miles from my home. I couldn't pass up an opportunity like this and I am glad I didn't. It dealt with many difficult questions that all of us ask at one time or another. The speakers made the conference a truly edifying experience based on their years of scriptural study and exegetical prowess. This set belongs in everyone's library, especially those who have questions. I started listening to RC about 11 years ago. I was amazed and captured by the value of the messages I was hearing on the radio. I have utilized the radio messages, books, and CD downloads. I have used much of the material from RC in my Bible study at church. My life has been transformed by this ministry! I wish I had a way to repay all I feel I have gained and every way I have benefited from this ministry. It is simply too big of a debt! Thank You!